Is this interpretation satisfactory or is it lacking? Is Michelangelo suggesting that God is nothing more than consciousness? Or that consciousness is the link between human beings and God? Or is he simply representing his understanding of a biblical story? In his article “An Interpretation of Michelangelo’s ‘Creation of Adam’ Based on Neuroanatomy,” Dr. Frank Lynn Meshberger suggests that the depiction of God as consciousness is a plausible interpretation of “The Creation of Adam.” He claims that Michelangelo’s sonnets and his study of anatomy provide evidence for this interpretation. Michelangelo’s sonnets suggest that creation first forms in the intellect before the hands can play their part and, using his knowledge gained from dissecting cadavers, he painted a representation of a cross-section of a brain to hold the source of creation: God. That is, if you look at the portion of the painting depicting God, those attending him, and the elliptically shaped fabric behind him, you can see the shape of a brain in cross-section. This is an interpretation that has the immaterial, that is, the mind and spirit, influencing the material, that is, the body. Is this a convincing interpretation of Michelangelo’s work? There is no way to be sure of Michelangelo’s intentions without him having stated them. In fact, Dr. Michael Salcman, a neurosurgeon, suggests that “our visual systems… fill in details and create meaning where no pattern or meaning may have been intended.” The human being is capable of seeing representational things in otherwise abstract shapes, such as our experience of seeing pictures in clouds. But, nonetheless, speculating about the possibilities of meaning has a curious way of producing meaning. 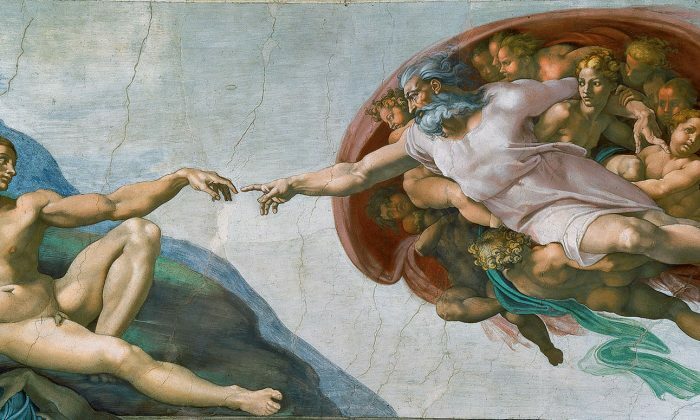 Before coming upon the interpretation of “The Creation of Adam”—that God is consciousness— I had only one: God is creating Adam according to Michelangelo’s understanding of Catholic doctrine. Being exposed to other interpretations, however, refreshes my own. Michelangelo was a devout Catholic and Jesus does say, “the kingdom of God is within you.” Maybe Michelangelo took this quote literally during his time dissecting cadavers, or maybe he is simply using his art to represent the immaterial. Irrespective of Michelangelo’s intentions, I now experience the fresco differently. I now look at Adam’s nakedness. We are born into this world naked and die leaving everything behind. Adam has nothing but the ground to lie on, his body, and the outstretched hand of God. Adam seems to exist as an intermediary between the divine and mundane. But what allows this? What allows God to come so close to touching the outstretched hand of Adam? Could it be his nakedness? To me, this nakedness represents an absence of selfishness. He is not owner of anything and seems to be without desire for anything. Even his outstretched hand is limp and lacks enthusiasm, and he is reclining in a relaxed and comfortable way. This isn’t indicative of how he feels about God, however, since his face is filled with adoration as he gazes upon the divine. It seems instead that this state of calm selflessness is the prerequisite for God to reach toward what He has created. The fresco itself is entitled “The Creation of Adam.” God creates Adam in such a way that is pleasing to God. It appears to me calm selflessness and a state of desirelessness are what is pleasing to God. One could argue, however, that Adam’s arm is only relaxed because God’s outstretched arm is in the process of giving life to Adam, and Adam’s arm has yet to be filled with life energy. His being in process of coming alive explains the relaxed pose and unenthusiastic demeanor. His expression—instead of adoration—is one of longing and desire for God to complete the task of giving life, which seems to contradict my previous suggestions. Even if this interpretation were the case, even if Adam has the desire for life, the longing and desire are only directed toward God and nothing else. Either way, the adoration—or desire—present in Adam’s expression is a prerequisite for or a result of God’s giving life. Maybe, however, God has already completed the task here: Adam is already animated. Adam is not coming to life but reacting to the gift of life. He has positioned himself in his reclined pose, and there is distance between their hands and adoration on his face as if Adam is showing his gratefulness for the gift of life. This indicates to me that Michelangelo has intentionally represented Adam in an animated but reclined, relaxed, and selfless pose in the presence of God as an expression of his gratefulness for God’s gifts. I’m not completely convinced that Michelangelo was secretly implementing the image of a cross-sectioned brain within which God sits; but if he was, I’d like to think that he did for the same reason: that only when we are in a relaxed and selfless state of mind will the divine reach out to us. The state of our minds is what allows us to experience the divine during our short stay here on Earth. I may not know Michelangelo’s intentions as far as this fresco is concerned. I do appreciate that approximately 500 years later, it still intrigues us. Maybe my inward investigation and reflection on this painting is part of my journey to the kingdom within. Art has an incredible ability to point to what can’t be seen so that we may ask “What does this mean for me and for everyone who sees it?”; “How has it influenced the past and how might it influence the future?”; “What does it suggest about the human experience? These are some of the questions I will explore in my series Reaching Within: What Traditional Art Offers the Heart. Eric Bess is a practicing representational artist. He is currently a Ph.D. student at the Institute for Doctoral Studies in the Visual Arts (IDSVA).